If there were ever a Title Bout for the Heavyweight Champion of Nintendo's RPG gaming community, Final Fantasy and Legend of Zelda would be toe to toe until the 12th round, both with hit titles on the Nintendo Entertainment System, Super Nintendo, and Game Boy. Final Fantasy is truly a classic, and in its wake has spawned the most prolific series in video game history. The most impressive aspect of Final Fantasy is that every game, including the first installment of the series, can be enjoyed no matter what year it is and no matter the current technology. Save the world! Wait, that's every video game story, isn't it? For the sake of uniqueness, save the whales! There's whales in the ocean or something, probably. Ehh, save the world. Five Airships speed across the sky. The Red Wings, the air force of the Kingdom of Baron headed by Captain Cecil, are on their way back to Baron after completing a mission in Mysidia. Cecil apologizes to Kain for involving him. But Kain does not blame him. "The King will return you to the Red Wings after this mission," says Cecil before parting. --From the Super Nintendo Final Fantasy 2 instruction manual. The story of Final Fantasy 2 follows Cecil, a soldier of the Red Wings who gets banished from his kingdom for having the courage to speak out against the questionable actions of his king. Cecil is more the classic hero as opposed to the hip, rabble-rousing brats that Square favours as its Final Fantasy protagonists these days. As the plot unfolds, Cecil matures and evolves from a straightforward military man into a knight with a broader purpose and worldview, just as the games story becomes more involved and sprawling as well. The cast of supporting characters is small but interesting, and its a shame that their personalities are compromised at times by awkwardly translated dialogue. The most sympathetic of the companions has to be Kain, a Dragoon knight and friend of Cecil who struggles throughout the game with guilt over his love for Rosa, Cecils girlfriend, and his betrayal of Cecil while under the mind-control spell of the villain Golbez. 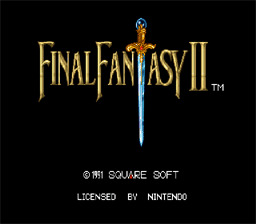 Final Fantasy 2 features upgraded graphics and sound, in a new story with the classic style of the original. Beings of pure magic once ruled the world with power and command. But power rarely leads to contentment... A dispute amongst these beings turned into an all-out war. Beasts of doom, known as Espers, were unleashed to do the bidding of their masters. This "War of the Magi" reduced the world to smoldering rubble. When it ended, the Espers were gone, as were most of the citizens of the world. Many centuries have passed since the war. Civilizations have been rebuilt with iron, machines and technology. For years the Espers have existed only in ancient legends. Now, an Esper has been discovered and the forces of magic are beginning to return. The risk of another, more devastating war is growing. --From the Super Nintendo Final Fantasy 3 instruction manual. Final Fantasy is one of the biggest games of all time. Almost all the Final Fantasy games rocked, and Final Fantasy 3 is no different. This is the first Final Fantasy to take place in the future rather than the past. It's a pretty interesting addition to the Final Fantasy series, so check it out. Eons ago, the Tower spewed forth beasts and monsters of many kinds. Adventurers set forth to end the invasions and find the legendary Paradise on the other side. Final Fantasy Legend is a pretty fun game. The graphics were a little lacking and so was the music. The game-play was pretty good though. It was a little tough to figure out at first, but once you get the hang of it, it's not bad. There are a lot of meats that you will need to know how to use. When a character eats a piece of meat, he will change into something else. What he will change into depends on two things, what he is now and what kind of meat he is eating. A list of the meats and their effects can be found at GameFAQs. When you get the hang of it, you really can build a strong party. There are a million combinations to choose from. If you like the Final Fantasy series, you should definitely take Final Fantasy Legend for a spin. This addition to the Final Fantasy saga was a lot like its predecessor. Classic Final Fantasy game-play with a twist on character promotion. After killing a monster, he may leave some meat behind. If you eat it, you may change into something else. For a list of the meats and what they will do check GameFAQs. This game takes a pretty long time to beat, and it has lots of replay value because you can always see how it would go if you started with a different combination of party members. Except for the lack of color, the graphics are still just as good as they were on the NES. The Final Fantasy legacy is still alive and well today, if you have never played this one or are just feeling nostalgic, click the launch button and get cracking. Millenia ago a fearsome battle raged between beings who sought to become the ruler of a place known as Pureland. Unfortunately for the rest of the universe, the Purelanders were immortal. But rather than causing them to give up the fight, this little fact actually seemed to spur them on to create new and more powerful weapons and magic attacks. The warring grew so violent that shock waves began disturbing neighboring dimensions, eroding the very beaches of time itself. The battle was spreading beyond the Pureland space-time continuum! Pounded by these shockwaves and fearing the loss of his own Universe, Sol, the Ruler of the World, built the Talon, a space-time battle cruiser with a drive system so powerful it could outrace light, and navigate the pathways separating dimensions. Commanding this weapon, Sol finally managed to seal the Pureland warriors in their own burned-out dimension -- but at a terrible cost. Exhausted after his ordeal, Sol returned to his universe with one last task to perform. He divided the internal mechanisms of the Talon into 13 units. Using his last ounce of energy, Sol simply willed the Units to various historical times and places on the World and Pureland. Having finished his work, Sol sank into a deep, deep slumber. A crackling thunderclap resounded through time, announcing the arrival of the Pureland Water Entity. The Entity shimmered with protective magical fields. So potent was the Purelanders' magic, that the colossal Water Entity was instantly visible to every generation that had inhabited -- or would inhabit -- the World. Only the Elder of Dharm, a city tightly sealed from the water, knew what the monsters were after; the legendary battle cruiser, Talon. The Units of the Talon -- wherever they were -- would have to be found, and installed, before the Monsters could find them, and before the World was swallowed by the sea. In Final Fantasy Legend 3, you play a character named Arthur. He is a young man that plans to do some time traveling with his friends in order to defeat a creature called the Pureland Water Entity. This creature is causing problems by constantly filling the sea with water. There are also monsters falling from its mouth all the time. This leaves little hope in the hearts of the people. After setting off and exploring a good portion of time, Arthur and his friends find out that there is more to this Pureland Water Entity than they thought. 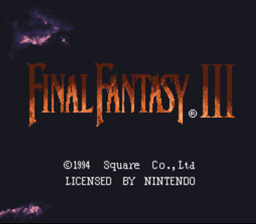 Final Fantasy Legend 3 was a lot of fun to play. There are a lot of options that you can pick and choose from when it comes to setting up your party. They kept true to the formula for eating meats to change your character into different things. Each creature has different attacks to choose from. It is a good idea to try different combinations of these to optimize your party. After you get the combination that is right for you, set out on your adventure and have fun! For centuries the Focus Tower had stood at the very heart of the World. It had been a center for trade and knowledge, and the people of the World had met there to peacefully settle their differences. But on one warm summer day, the Tower was suddenly transformed into a symbol of the purest evil. For on that day, powerful monsters battled their way into the Tower, stole the four Crystals of the Earth, and then took off with the magical Coins that had kept the Tower's doors unlocked. 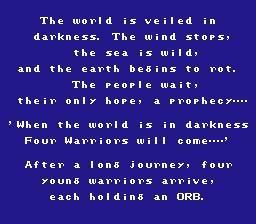 --From the Super Nintendo Final Fantasy Mystic Quest instruction manual. I really liked this installment in the Final Fantasy series. Mystic Quest incorporated some very cool improvements. The gameplay has been improved, letting you choose your battles, and giving more options for exploring the territory. Another improvement in Mystic Quest was the graphics. I liked the graphics in this one better than its predecessors. They looked a little more cartoonish and I like that. The sounds were pretty good too. I like it when they keep some of the same sounds and music from the older games. 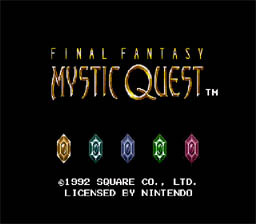 Final Fantasy Mystic Quest is a great RPG and I suggest you direct a large portion of your life to it. Just kidding! Give it a try though.